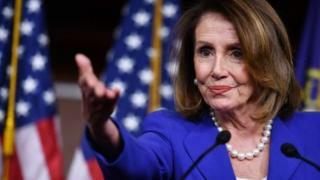 US Speaker of the House Nancy Pelosi is due to begin an official visit to the Republic of Ireland later. Speaking on the eve of her visit, she said there would be “no chance whatsoever” of a post-Brexit trade deal between the US and UK if there were any weakening of the Good Friday Agreement. Ms Pelosi is expected to meet Taoiseach (Irish Prime Minister) Leo Varadkar on Tuesday evening. It is understood Brexit will be one of the main topics of discussion. She will be accompanied by a delegation of Democrat and Republican congressmen and women. The delegation is expected to visit Northern Ireland later this week. 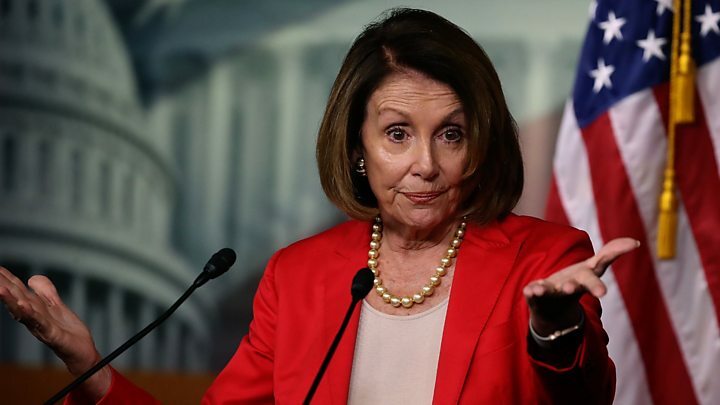 Speaking at the London School of Economics on Monday evening, Mrs Pelosi said the 1998 Good Friday Agreement was a model that could not be “bargained away in another agreement”. “First of all it is very hard to pass a trade bill in the Congress of the United States, so it’s no given any way,” she told her audience. “But if there were any weakening of the Good Friday accords, there would be no chance whatsoever, a non-starter for a US-UK trade agreement. “The Good Friday accords ended 700 years of conflict. Mrs Pelosi said she wanted “to express America’s enduring commitment to a peaceful and prosperous future for all who live there”. She added that the UK and Ireland “each have a deep and special bond with the United States”. Media captionWho is Nancy Pelosi? On Wednesday, she is expected to meet Irish government and opposition politicians before addressing both houses of the Oireachtas (Irish parliament). Ms Pelosi and the delegation are also due to meet Irish President Michael D Higgins at his official residence, Áras an Uachtaráin, in Dublin’s Phoenix Park. Later on Wednesday evening, there will be a state dinner in Dublin Castle to honour Mrs Pelosi and the delegation, which includes chairman of the house ways and means committee Richard Neal and Congressman Brendan Boyle. Details of the delegation’s visit to Northern Ireland have yet to finalised. The European trip also includes visits to Stuttgart and London. US President Donald Trump has indicated that he will visit Ireland later this year.